We are at a cross road in human evolution. The paradigm of the collective conscious is in crisis. A revolution is taking place. “Like a volcano that’s about to blow, a society that builds social order on institutionalized soul denial gets progressively violent rumblings, until it looks as if civilization is coming apart at the seams. “ a quote from The paradigm Conspiracy. This is what in naturopathic terms is called a healing crisis. Things appear to be getting worse but it’s just the bodies way of bringing the illness up and out to heal the core of the dis-ease. The same situation is occurring with our beautiful earth. Just like a caterpillar building its own chrysalis to go to sleep for months, so it can morph into a butterfly. It has to die unto itself to be reborn and to be set free. Change is inevitable, growth is optional. 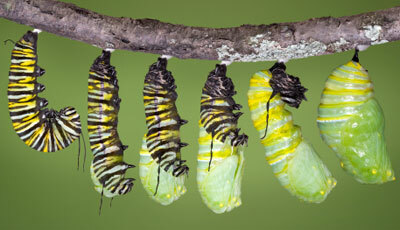 The evolution is already taken place, we are in the chrysalis. Eleonor Roosevelt a pioneer in the women’s movement said “We must do the thing we think we can not do.” It’s time we all take our power back and face our fears as a collective force, and awaken to a new and brighter tomorrow. This entry was posted on Wednesday, January 12th, 2011 at 11:10 am and is filed under Uncategorized. You can follow any responses to this entry through the RSS 2.0 feed. You can leave a response, or trackback from your own site.